“A Wrinkle in Time” (2018). 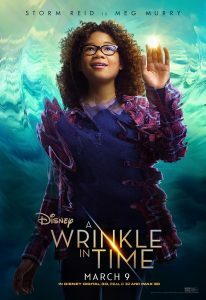 Cast: Storm Reid, Oprah Winfrey, Reese Witherspoon, Mindy Kaling, Chris Pine, Gugu Mbatha-Raw, Levi Miller, Deric McCabe, Zach Galifinakis, Michael Peña, André Holland, Rowa Blanchard, David Oyelowo, Daniel MacPherson, Conrad Roberts, Yvette Cason, Will McCormack, Bellamy Young, Lyric Wilson. Director: Ava DuVernay. Screenplay: Jennifer Lee and Jeff Stockwell. Book: Madeleine L’Engle, A Wrinkle in Time. Web site. Trailer. When physicist Alex Murry (Chris Pine) goes missing, his disappearance creates a mystery – and a variety of problems. At the time he vanished, Alex had been studying the theoretical notion of folding over time, creating a “wrinkle” in the fabric of the Universe that would make it possible to traverse great distances instantaneously. This audacious idea was groundbreaking but largely considered implausible by Alex’s peers, who openly laughed at him when he publicly presented his theory. Even Alex’s scientist wife, Kate (Gugu Mbatha-Raw), who helped him develop the concept, believed that he should proceed cautiously in publicizing it, given its radical nature and the fact that not all of the details were worked out, conditions that left him open to ridicule. But Alex, eager to see things though, was undeterred by the doubt and scorn. And, even though the nature of his disappearance was never officially confirmed, those close to him believe that he figured out how to make things work and went on a journey across the cosmos. But was this indeed true? And, if so, where was he now? 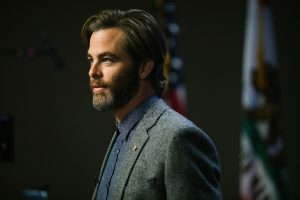 Physicist Alex Murry (Chris Pine) tests out his inventive theory about how to instantaneously traverse the Universe in Disney’s new fantasy adventure, “A Wrinkle in Time.” Photo by Atsushi Nishijima, courtesy of Disney Enterprises, Inc.
Alex’s unexpected absence creates more than a scientific conundrum; it also raises a number of issues for his family, especially his 13-year-old daughter, Meg (Storm Reid). As a bright but somewhat temperamental teen, she experiences the usual adolescent issues of fitting in, challenges made worse by her dad’s absence and by the routine taunting she receives from those who mock her father and his ideas. These circumstances land her in trouble at school, further complicating her life. All is not lost, though, thanks in large part to the support Meg receives from her protective, encouraging friend, Calvin (Levi Miller), and her younger brother, Charles Wallace (Deric McCabe), a prodigy who believes in his older sister’s ability to resolve her challenges. However, Charles Wallace has even higher hopes for Meg; he believes she’s capable of finding their missing dad. Before long, Charles Wallace introduces Meg to a trio of magical interdimensional guides whom he believes can help her find Alex, Mrs. Whatsit (Reese Witherspoon), Mrs. Who (Mindy Kaling) and Mrs. Which (Oprah Winfrey). They share insights into how Meg can proceed with her quest, providing the means and the wisdom to move forward. And so, in no time, Meg, Charles Wallace and Calvin, accompanied by their guides, pass through their own wrinkle in time to search for the missing scientist. 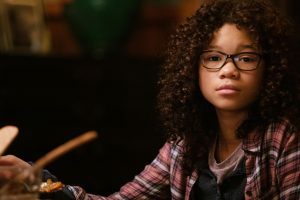 Troubled teen Meg Murry (Storm Reid) faces a variety of challenges at home and in school when her physicist father mysteriously disappears in the inspiring new fantasy adventure, “A Wrinkle in Time.” Photo by Atsushi Nishijima, courtesy of Disney Enterprises, Inc.
As their journey unfolds, the travelers visit a number of beautiful and mystical locales where they meet a number of unusual individuals, such as a seer known as the Happy Medium (Zach Galifinakis). But, even with the newfound knowledge and experience they amass during their trek, Meg and company are no closer to finding Alex. Eventually their travels take them to a foreboding land known as Camazotz, a place characterized by ever-present deception and an ever-growing evil. If this band of seekers is ever to achieve their goal, they’ll need to tackle a number of additional challenges, many of which relate to their personal growth and development. But, if successful, they’ll be able to embrace skills and traits that they can employ in taking on the perils of Camazotz – and, one hopes, that they can take back home with them (that is, if they ever manage to escape). Fortunately, Meg and company figure out ways to rise to the occasion, thanks in large part to the principles of conscious creation, the philosophy that maintains we materialize the reality we experience through the power of our thoughts, beliefs and intents. While this band of explorers may have never heard of this discipline, they nevertheless engage in many practices reflective of its concepts, as evidenced by the results they attain. For instance, extraordinary challenges require extraordinary measures to overcome them, something that innately calls for thinking outside the box. As Meg, Calvin and Charles Wallace wend their way through their journey, they’re frequently called upon to do this, conceiving of and implementing the means and methods to succeed in their tasks. This may push them outside of their respective comfort zones, especially when it involves considering and making use of ideas that run counter to the restraints of the conventional wisdom (something they run up against routinely in their everyday dealings before embarking on their quest). However, when they see the payoffs that come from such unconventional undertakings, they can take pride in having successfully embraced and employed these notions. Mrs. 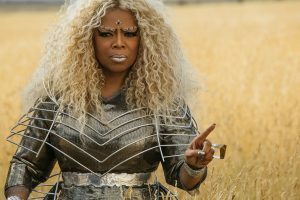 Which (Oprah Winfrey), a sage old soul, is one of three metaphysical guides charged with aiding a troubled teen search for her missing father across the cosmos in the new fantasy adventure, “A Wrinkle in Time.” Photo by Atsushi Nishijima, courtesy of Disney Enterprises, Inc.
Of course, making such bold moves and surpassing such restrictions takes courage, specifically a willingness to confront and conquer our fears, something that often holds us back in our lives and manifestation efforts. By doing this, however, we can successfully forge ahead, making it possible to implement innovative solutions that solve our problems and empower us as masters of our destiny. That’s quite a bargain for being willing to take a few chances now and then, especially if we believe in the realization of our desired outcomes, as well as our own abilities. This is not to suggest that we should proceed recklessly; it means assessing our prospective beliefs carefully, evaluating the intellectual and intuitional input that goes into their creation, selecting the belief candidates that appear more likely to succeed, and putting them into place. This is the power of discernment at work, a key component in the efficient functioning of the conscious creation process. It’s something that may take a little trial and error to perfect, but it often proves invaluable, especially when we find ourselves embroiled in our own personal versions of Camazotz. It’s a skill that helps us cut through the deception, and the examples set by Meg, Calvin and Charles Wallace provide valuable insight into how we can make use of it. 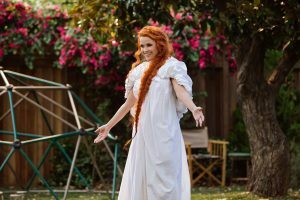 Mrs. Whatsit (Reese Witherspoon), a magical, shape-shifting spirit, helps a troubled teen search for her missing father across the dimensions of the cosmos in director Ava DuVernay’s latest release, “A Wrinkle in Time.” Photo by Atsushi Nishijima, courtesy of Disney Enterprises, Inc.
Taken together, experiences with these principles reveal to the intrepid travelers aspects of themselves that they were unaware of before launching into their journey. Coming face to face with parts of ourselves we never knew existed can prove quite revelatory, not to mention personally empowering. It shows that we have talents that we can employ in addressing all kinds of challenges, as well as in pursuing ventures we may have never previously considered. To that end, the travelers’ multidimensional adventures are inherently a metaphor for their multidimensional selves, showing them their true nature and providing them a valuable learning experience in how to tap into it. Thus, as Meg, Charles Wallace and Calvin explore these far-flung exotic dimensions, they learn a variety of valuable life lessons, teachings that are just as pertinent to their peers in the viewing audience as they are to the characters on screen. In that regard, then, the film is highly instructive to impressionable young minds in need of hefty doses of such noble qualities as responsible thinking, courtesy, consideration, compassion and personal self-empowerment. That’s not a bad message for those growing up in an age typified by rampant cynicism, self-absorption, incessant fear mongering and less-than-honorable behavior. 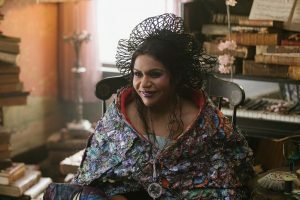 Mrs. Who (Mindy Kaling), a storehouse of inspirational quotes, provides insights that help a troubled teen search for her missing father in “A Wrinkle in Time.” Photo by Atsushi Nishijima, courtesy of Disney Enterprises, Inc. However, with that said, “A Wrinkle in Time” is also a frustrating watch at times. As ambitious as it is, the picture is somewhat uneven, an issue attributable mainly to its problem-ridden screenplay. Having not read the Madeleine L’ Engle book on which the film is based, I can’t personally vouch for how faithful it is to its source material, though I have seen many accounts that suggest that the original story would undoubtedly make for a difficult adaptation, largely due to the breadth of topics addressed in it. And, as I screened the film, I truly got that sense, that there had to have been material that was left out – and whose exclusion from the script had to have impaired the flow (and sometimes the comprehension) of the story. What’s more, some of the screenplay’s treatment of the source material seems rather anachronistic. For example, hordes of scientists scoffing at Alex’s radical theories may have been the norm in 1962, when the book was written, but they’re far from laughing matters among contemporary physicists, many of whom consider the notions presented in the film quite legitimate. Also, given the sensibilities of the movie’s target audience – pre-teens and adolescents – the film includes elements that I can’t help but think would be either a little too complex and/or a tad frightening, especially for younger tykes. While I applaud the picture’s efforts to incorporate and disseminate information about such enlightened topics as the inherent harmonious nexus between science and spirit, the related principles (especially those of a scientific nature) are often explained in ways that could easily sail over the heads of viewers not well versed in the subject matter (most likely younger viewers). Yet, despite these shortcomings, “A Wrinkle in Time” also represents a valiant cinematic undertaking. It’s indeed refreshing to see a film boldly take on the kinds of subjects it addresses, especially for a younger audience. Director Ava DuVernay does a commendable job in crafting a finished product that makes the most of the script she had to work with. The film’s dazzling special effects are worth the price of admission, presenting gorgeous images reminiscent of such releases as “Avatar” (2009) and “What Dreams May Come” (1998). And the picture’s genuine warmth comes through loud and clear, thanks to the heartfelt performances of the ensemble’s principals. When life hands us circumstances that seem patently unreasonable or inequitable, we may be tempted to lash out, especially if we’re not equipped with the coping skills and creative thinking needed to address such issues. But all need not be lost. With a little ingenuity and a properly focused moral compass, we can take on these challenges and overcome them. And sometimes all it takes is a little wrinkle in our thinking – or our existence – to reach our goals.